I don’t “get” fashion sometimes. Fashion is so elusive that I really, really feel that I’m just falling into pile of dirty laundry and I don’t have any senses because the gross, noisome smell of the dirty laundry is disabling all my senses. Fashion is like that sometimes, that I don’t know what to make of it at all. Fashion isn’t stupid. Fashion, like any other interest is what you want to make it to be. Fashion can be shallow, like that show with a name that eludes me, where some girl is shopping for clothes, needing the latest Gucci or Chanel clothes, going like “I think this makes me look fat. Next!” with a Cali girl accent. Fashion can be deep. It can be about the shape of the overall clothes, the quality, the stitching, the intricate detail of the work, and the amount of work that ateliers put into the work. Fashion is, in the end, what you make it to be. Car lovers will say that knowing the engine, the transmission, the quality of the fluids that you put into the car is important. The make, the brand, the model. However, to me, a person who only cares that a car can get me to places, cars bore me. I find it kind of weird that people would care so much about a hunk of crafted metal. Fashion is the same; it can appear stupid or inconsequential to outsiders. However, both types of people what to know the quality, the make and everything else. I don’t know why (okay, I do, it’s the media’s portrayal) but I think that some buff macho dude (sorry, if you’re a car lover and you do not look like this) will object to my comparison of two different things. The bottom line is, they’re similar. I’ve heard some fashion people say some really not so smart things. People think, “Really? That’s why you work in fashion, the industry that needs the least amount of brains.” No. That’s not true. The people who come up with the ingenious marketing campaigns need brains. Don’t tell me that creativity doesn’t need brains. Fashion designers reference history (Jason Wu and his Fashion Week NY collection referencing China, anyone?). While fashion designers may not be the next scientist that’ll get a Nobel Prize, it doesn’t mean they’re clueless. They need to have brains to reference history and tweak it in such a way that’s exciting and fresh. Don’t tell me that’s easy because let’s see you do it. Don’t tell me that all fashion industry people are dumb. It’s annoying. Eva Chen, the beauty director (actually her position is Beauty and Health Direction/Special Projects Director) was a premed (and prelaw student) at Johns Hopkins. She finished her high school science courses by age 15. She took courses at Barnard College in her summers during high school. I’m pretty sure that she’s not dumb. I’m pretty sure that if the people around her were dumb, she wouldn’t be working in fashion. However I’m waxing my poetic love for fashion, there are things that I don’t get. My June/July issue of Teen Vogue came in the mail, and there it was, the Coachella spread. 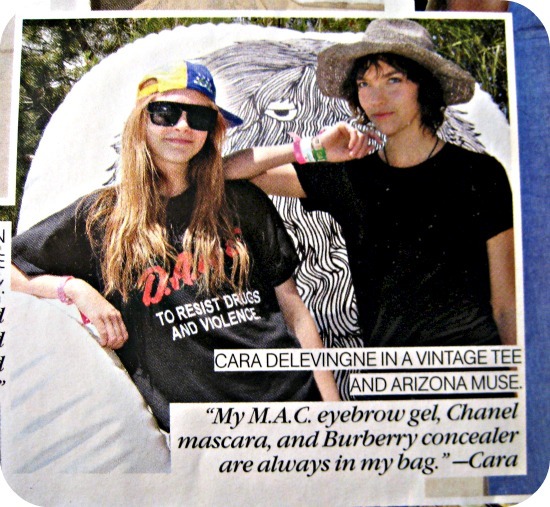 Cara Delevingne (a famous model) wearing a DARE t-shirt. (Check out the following picture.) Oh wait, sorry, a “vintage tee”. There was a time when “vintage” meant old designer goods. Last time I checked, DARE t-shirts were not vintage by definition. DARE t-shirts aren’t even old. Heck, I have a DARE t-shirt that I got in elementary school. Someone should take a picture of me too, and place it in a fashion magazine. I have a problem with the word vintage too sometimes. A pair of new (but distressed) pair of pants are called vintage. A pair of boots that reference equestrian riding boots are vintage. A new necklace that references 1930’s jewelry is called vintage. Can people just properly just say the proper references so we don’t call our Ticonderoga pencils vintage, too? We might as well when we’re at it. Oh wait, we should call our MP3’s vintage too. You know, they’re so old, because well, vintage means old. No, it doesn't. It can mean, "representing the high quality of a past time", "old fashioned or obsolete", or "being the best of it's kind" (I've added all the applicable definitions that I could find from dictionary.com). But back to the whole DARE t-shirt thing. Okay, fine, some model was wearing a shirt that I got for free at school. What makes models good at what they do is that they find a particular attitude for whatever clothes they’re wearing at the moment. When a model’s wearing a diaphanous, dainty dress, she’s going to look vulnerable. (She could go for a brave, rebel attitude , too.) While I look like I just woke up whenever I wear my DARE t-shirt (I use it as pjs) the model looked, well, with an attitude with her Wayfarers, her sideways hat and her nonchalant expression. So yeah, you know, some models just make ugly shirts look cool. That’s why they’re models right? But don’t you dare call that shirt vintage.